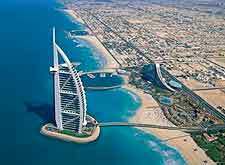 Dubai features an arid, subtropical climate and is a truly spectacular modern setting, being located on the northern coast of the United Arab Emirates. Lying next to the waters of the Persian Gulf, the city of Dubai offers plenty of hot, dry weather all through the year. Those looking for sunshine will not be disappointed when visiting the city. Average summer temperatures hover around 38°C / 100C, often rising higher during the hottest days. Many people both visiting and living in Dubai take advantage of air-conditioned buildings during the height of the day, emerging as temperatures reduce and the warm and balmy evenings approach. However, the summer heat in Dubai tends to be fairly dry, making the high temperatures more tolerable. The winter season, from December to February, is a particularly popular time to visit the city of Dubai, when temperatures average 23°C / 73°F by day, falling to around 15°C / 59°F at night. The average annual daytime temperatures in Dubai are around 32°C / 89°F.